For its seventh launch of the year, Arianespace will use an Ariane 5 ECA from the Guiana Space Center (CSG) to send the BepiColombo spacecraft on its way to the solar system’s smallest and least-explored terrestrial planet: Mercury. After launching the successful Rosetta mission in 2004, Arianespace once again helps unlock mysteries of deep space. Flight VA245 will be performed from Ariane Launch Complex No. 3 (ELA 3) in Kourou, French Guiana. The Launch Readiness Review (LRR) will take place on Wednesday, October 17, 2018 in Kourou to authorize the start of operations for the final countdown. Carried out jointly between ESA and JAXA, BepiColombo is an interdisciplinary mission to Mercury, the smallest and least explored planet in our solar system. The Mercury Composite Spacecraft (MCS) consists of the MTM, MPO, MMO, and MOSIF. The Mercury Transfer Module (MTM) will carry the two orbiters (MPO and MMO) to their destination whereas the MMO Sunshield and Interface Structure (MOSIF) will provide thermal protection for the MMO. 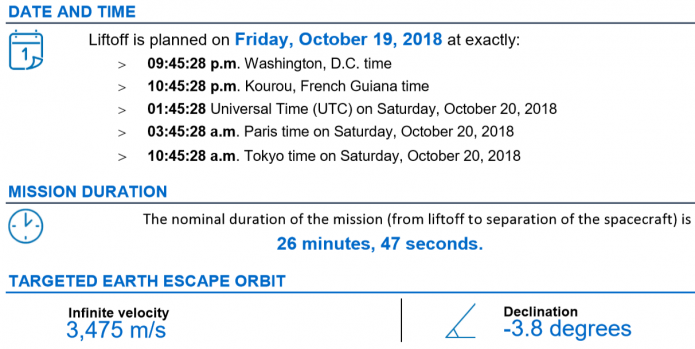 The purpose of Flight VA245 is to inject BepiColombo into an Earth escape trajectory, allowing its European and Japanese probes to reach Mercury after a seven-year voyage through space, arriving in late 2025. BepiColombo will then conduct a one-year nominal mission, with a possible one-year extension. BepiColombo will be the 51st mission to be performed by Arianespace (with the 73rd satellite) for the European Space Agency, and the 23rd mission at the service of deep space exploration. By launching BepiColombo on behalf of ESA, Arianespace thus continues to guarantee Europe’s independent and reliable access to space, furthering the knowledge of our universe and for a better life on Earth through European initiatives. BepiColombo was built under the industrial leadership of Airbus Defence and Space at its Friedrichshafen space installation complex, in Germany. BepiColombo will be the 121st Airbus Defence and Space spacecraft to be lofted by Arianespace, whose backlog currently comprises 22 additional satellites to launch for the global manufacturer. To watch a live, high-speed online transmission of the launch (including commentary in French and English from the launch site), go to arianespace.com or to youtube.com/arianespace on October 19, 2018, beginning 40 minutes before liftoff. Arianespace uses space to make life better on Earth by providing launch services for all types of satellites into all orbits. It has orbited more than 570 satellites since 1980, using its family of three launchers, Ariane, Soyuz and Vega, from launch sites in French Guiana (South America) and Baikonur, Kazakhstan.